It all started with the purchase of a plane ticket to Iceland. Prices were fair enough: 550$cad including a ski bag. Small issue at Montreal airport with WOW Air. They would not allow the extra weight for the ski bag. We had to remind them their own terms on their website so they would not charge an extra. They warned us that we would most likely face the same issue on our return to Canada. Finally arrived in Keflavík, we take the shuttle that gets us to the car rental companies and rent a small 4x4 for our trip to the Troll Peninsula. It’s 4am and the wannabe Jeep is loaded, direction Siglufjörður . During the six-hour drive, we got to watch mystical scenery unfold under the rising sun. It kind of reminded me of scenes from ski movies and pictures from trip reports of Iceland. Now, this is for real. For the skier’s eyes, it is a living and intriguing landscape that you need to investigate with no further ado. We arrived at our accommodation for the next six nights, we unload the car and take time to meet the charming owners of the Hiring Guest House. We then got to see the village on our way to the local ski area. This is where we made our first Icelandic turns after a few dozen hours of travel! The snow is incredible. 4-8 inches of powder everywhere. After our first run, we put the skins back and end up bootpacking a beautiful couloir that caught our eyes on the road earlier. Finally, very satisfied with our first couple of hours in Iceland, it was now time to sleep to get back at it the next day. We’re heading to Ólafsfjörður, a village 15 minutes further east of Siglufjörður. After crossing the one way tunnels and a ghost fjord, we arrived in paradise. This is where we spent day 2 and 3 skiing couloirs, bowls and faces in perfect powder conditions. Big wind, heavy rain. The locals tell us this is the biggest avalanche cycle in 30 years. The danger is high. We play it safe, deciding to drop into the thermal baths of Grettislaug. It’s a stretch taking two hours to drive in which we stoped all along the way to take pictures. Upon our arrival, the weather was so bad that the owner of the baths suggested that we load our car with rocks so that it doesn't drift away in a fjord. He told us he’d never take the road to Siglufjörður these days. We decided to go anyway. The 60mph wind probably explained why we were the only ones swimming. It's okay, it's hot water… but not so hot with the arctic gusts! Hail even came sideways in our ears. Needless to say, getting out of the bath was a challenge! Back home, unable to NOT go skiing, I make a plan to go to the nearest summit, which is literally across the street. Due to the intense weather, my partner decides to take it easy. Solo mission time! On my way to the summit using the ridge, the wind had thrown me to the ground several times. I took advantage of this wind that I estimated to be arond 100mph to help me ski up the ridge. Stormy, windy weather is still in the cards today. Heading to Dalvík, northern capital, to meet a long time friend where we shared a not-so-good fish and chips. We discuss visiting Dalvík ski area but it is closed for the day because of wind, rain and slush. Back home in the rain. I decided to go ski a line I had seen the day before. "Do not leave fish to find fish” they say, so 15 minutes after leaving the house, I was standing at the bottom of this nice couloir. The weather is worse than the last two days. The neighbours look outside through their windows, doors and garages and wave hands at each other, telling themselves the Icelandic version of " Tabarnak ", probably the most satisfying word of the quebecois swearing dictionary. So we do the same, deciding to leave a bit ahead of schedule fearing the headaches of ski bag weight as well as returning the car at the airport. In the past few days, snow had melted drastically during the night, to a point were it was not inviting to go out skiing anymore. Thinking that at best, we could see a peak shining in the sun on our way. As a matter of fact, we found a road sheltered by mountains that lead us to a small ski resort with only one run and one lift. The snow is ice cold and the resort is closed. The wind is constant at more than 50 mph. Reaching the top which was a huge plateau like Mount Albert in the Gaspé peninsula, the wind makes it virtually impossible to remove our skins. Once ready for the descent, bindings locked in, we jump on the slope can barely pick any speed due to the heavy wind facing us directly. This was a down hill race to the Jeep. Reaching Reykjavik ahead of time, we take a walk in the city and join some friends. We take advantage of the International Waffle Day to hang on in a pub with friends and cry our departure from Iceland! Finally arrived at the airport, we return the car and head for WOW Air kiosk. We’re first in line… three hours ahead!. They don’t even weight our bags and there we go, no luggage issue. Jul looks at me and we start laughing. Our flight is delayed another three hours. I took the time to walk Keflavík airport 14 times back and forth to pass time. Distractions were hard to find, as I needed to keep enough battery in my phone to confirm my ETA to my friend Marc who’s picking me up at the airport. We land in Montreal 5 hours later, only to get out of the plane 2 hours later as something was broken on the plane. 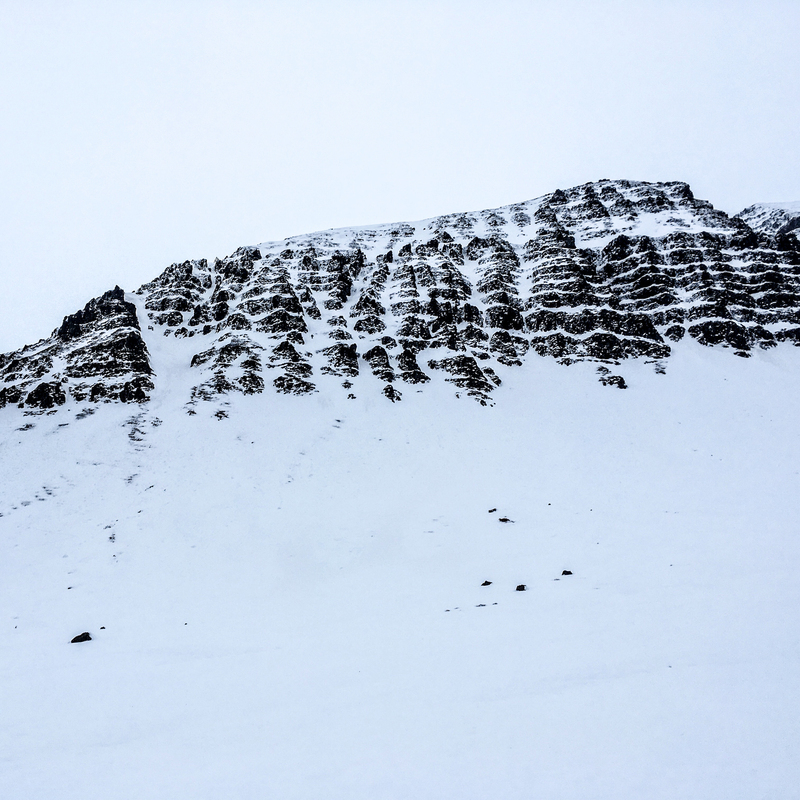 When I finally got off, I know I would be back soon to ski all the summits of Iceland! Photos and video content courtesy of Félix-Savard-Côté, you can follow him on Instagram @skifelix. Riders: Félix Savard-Côté and Jul Houde.